← Coyote encounter at Elephant Butte! Yesterday I marvel at the balmy weather in the month of November . . . blue sky, fluffy clouds, warm breeze, sunshine. Today the crew and I wake to miserable grayness, sand-blasting wind, and cold, cold, cold! What do you do on such a day as this? Stay in bed and keep the remote nearby! Keep warm under the covers! Only go outside if you absolutely have to! "I've had enough. 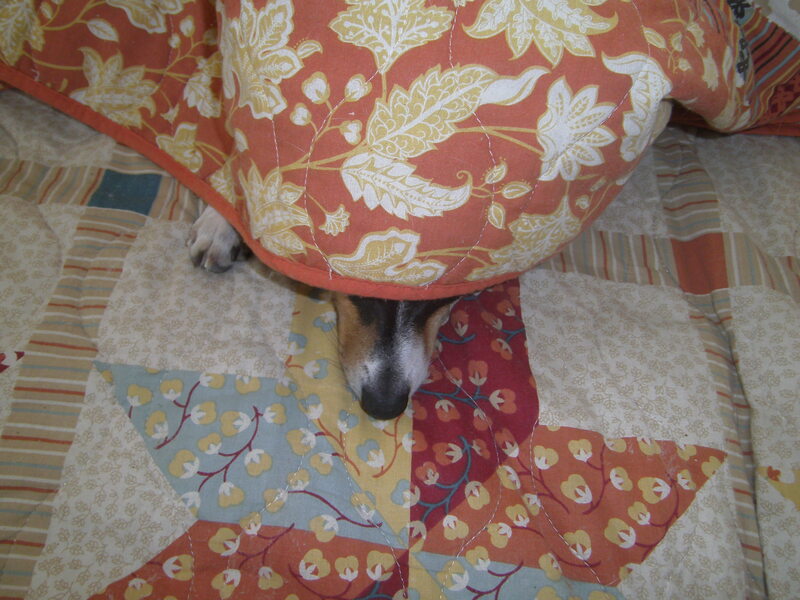 I want my covers." And wish for a warm, sunny day tomorrow! 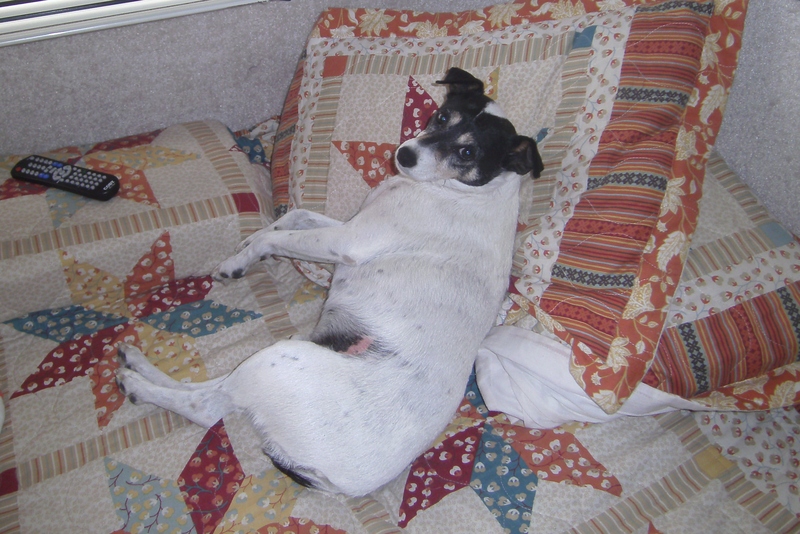 This entry was posted in Bridget The Widget, Simple living, Spike The CoPilot and tagged campground, fulltiming, New Mexico, wind. Bookmark the permalink. And one other thing ….you can be soooo thankful that you got that heater installed with perfect timing. November is a month to look back and count your many blessing ( especially the 4 legged ones) and look forward to the many wonderful experiences that lie ahead for you!!!! You’re right, Ernest! A big blessing is having a warm place when it’s cold outside. El Paso.. The very first night, there came up a sandstorm and the next morning they had SILVER Oldsmobile instead of a maroon one!! The windows were white with sandblasting!! I noticed Spike took his bone with him… That coyote will probably like to chew on it too, also!!!! What a terrible thing to happen to a new car! You stay warm, too! Okay, I’ve got to comment on a comment. Butterbean Carpenter, this is too funny! I thought New Mexico’s windy season was spring! I’ll never again back up the trailer all the way to the concrete bumper so I can’t put the stabilizers down. Oh, this was just a test? You mean the real thing hasn’t arrived yet? I think Bridget is giving you a bit of the old Stink Eye! Let’s go inside now Mom. Bridget is The Grand Master of The Old Stink Eye. We had some really gusty stuff here late yesterday and last night with some real hard rains. My rig was rocking good. And today is chilly compared to when I arrived. But I decided to stay 2 more nights I just love it. I am so happy that you are loving it! If you give a solar panel a good sand blasting it will put out 10% of what it did new, Think about a wind proof cover. Maybe with it flat on a roof it won’t get hit so badly with sand? You’ve got me wondering how people protect their panels in the Southwest. I probably should have something ready, even though I’ll be caught by surprise, no doubt. I think that most of the time the sand is close to the ground so anything a few feet high does not get hit that bad. Otherwise people would have to replace their car windshields every year. I drove through a sand storm in Nevada in 1967 and my front license plate was stripped of paint but not the car. The sand was only one foot off the road. I like your positive spin on it, Kay! If it is any consolation, it is freezing level here in New Westminster (near Vancouver BC). 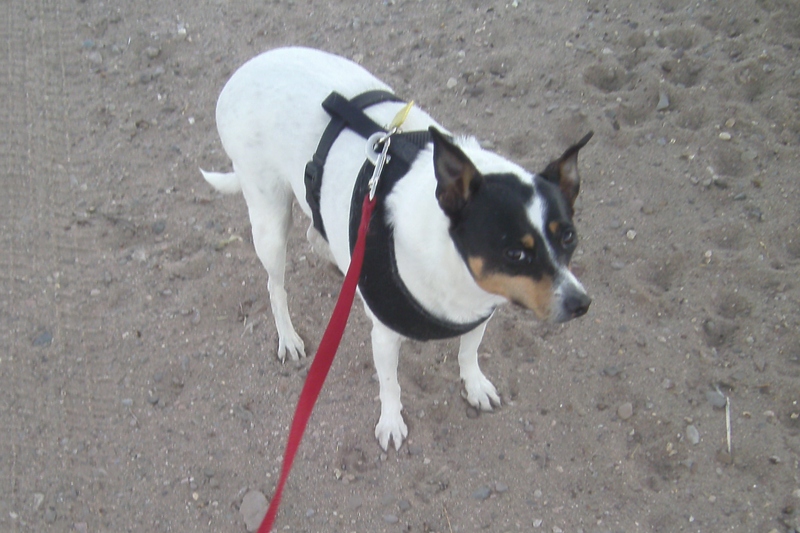 My little rescue rat terrier, Scout, isn’t hanging around outside too long either. Soon he will have to suffer indignity of wearing his red fleece jacket, or even layering it with a jaunty sweater. Brrr. I discovered your blog a couple of weeks ago, Sue, and I just wanted to let you know how much I have been enjoying it. I, too, am a teacher, thinking of retirement (still a ways off, but close enough to dream) and where I might wander. Thank-you for your writing, and the dreams it inspires! As a native upstate New Yorker I have some idea of what you are going through. I must seem like a whiney baby, fussing about weather in the fifties with a bit of wind, while you are freezing! 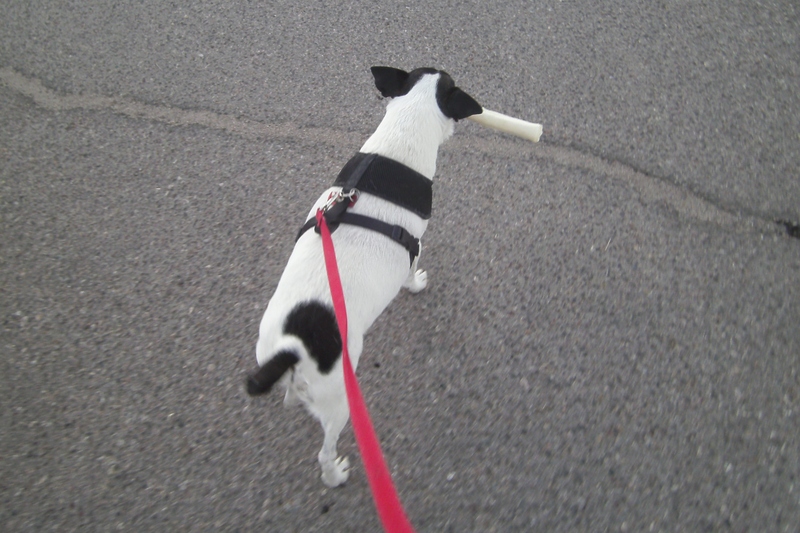 Rat terriers are the best. Scout is a great name for a terrier. Spikey loves wearing a coat. Bridget, not so much. No surprise there! I’m glad you found my blog and that you enjoy it. We do have a lot in common. Keep your dreams alive! Ok, Butterbean has mentioned your newness to billybob, and now he’s asking ‘who is Sue?’ so go over and introduce yourself: http://billybobsplace.blogspot.com/ His is a good blog to follow for information and entertainment, just don’t tell him I said so. Found your blog recently. Have to say that yours and a few other blogs have me wondering again about Casitas. I’m a ways away from the RV life, but I’m working (literally…) my way there. Thanks for the link. I visit billbobsplace almost every day. He should know who I am as he is a buddy of Old Fat Man and OFM and I met not long ago. OFM mentioned me on his blog. We have to get this all straightened out! If you like to keep things simple and tend to be a minimalist, not a collector, Casita’s are great. I love mine. Good luck working toward the RV life! Speaking of wind blowing, we found out at the Davis Mountains State Park on Wednesday night that when the wind REALLY blows, there’s a draft under the escape window from the two small drain slots in the bottom. We pinned a towel up over the bottom of the window to keep the draft off our necks. We’d been sleeping with our heads under the window for four weeks and that’s the first time we felt the draft – but a COLD wind was whipping 20-30 mph outside. Glad we had stabilizers out on all around. Nice to hear from you again, CeCe! I think the balmy days are dwindling.. Winter is on it’s way. I’m so glad I got my heater installed!